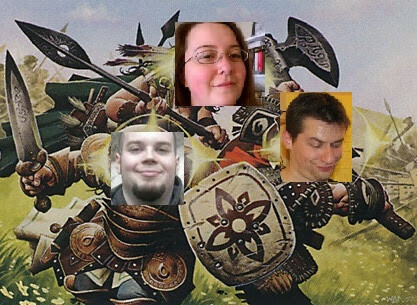 That’s right: it’s a three-person team with myself, Cassidy and Brionne forming a Thoughless Trio and raging around the digital countryside as we carry the torch for our missing fourth, nonetheless pledging to deliver another episode of CommanderCast. A grab-bag of topics emerge for your listening pleasure this week, ranging from the place of Commander as a ‘side event’ at major tournaments to the return of Prepackaged, where we discuss Sunforger. There’s laughs, I cried, and at some point I think Cassidy might have puked but he’s awesome at hiding it. 02:55 to 23:05: Free-For-All Roundtable: Organized EDH Events: After our own involvement and a huge amount of audience feedback on this topic, we figure it’s time to discuss Commander and events organized by vendors, TOs, and the like; tournaments, pods, and so on. So what are our thoughts on the traditional organization methods of play when it comes to Commander? What’s the role of these overseeing entities once the format shifts from a competitive one to a casual one? What’s the place of tournaments and paid-entry pods, and prizes? All this and more in another circle of flame! THE FREE-FOR-ALL ROUNDTABLE DOES IT TO THE DEATH! 23:17 to 38:15: Other People’s Cool Decks: This is a segment I jacked from Horde of Notions, Chris Lansdell’s rogue deckbuilding podcast (I didn’t realize it at all the first time we recorded it but there you go). We play a lot of Commander and subsequently we run into a lot of decks. As most EDH players tend to, every now and then we bump into a deck that makes us say “wow, that’s awesome”. Even the most jaded and disgruntled players occasionally bump into a deck that makes them smile because it’s different, stylish, or so utterly off-the-chain it’s undeniable. In this segment, we’re all talking about decks we found interesting or unique and why we liked them, using it as a springboard into the great discussion of what makes a truly memorable deck in the first place. By totally excluding some of these elements, can you gain more than you lose? 58:34 to 1:15:04: Prepackaged: Sunforger: The second installation of Prepackaged was obvious once the feedback from the first came in: people want Sunforger covered, and they want it done now. I figured this was pretty well-explored territory, but I guess not well enough! Sunforger has been called “the reason to play R/W.” In this segment we discuss how many cards should be Sunforgable, how much effort and support the card needs to function, and it’s overall usefulness in our experience followed by a few suggestions we feel any Sunforger package should include. 1:15:25 to closing: Outtro: Thanks for listening!